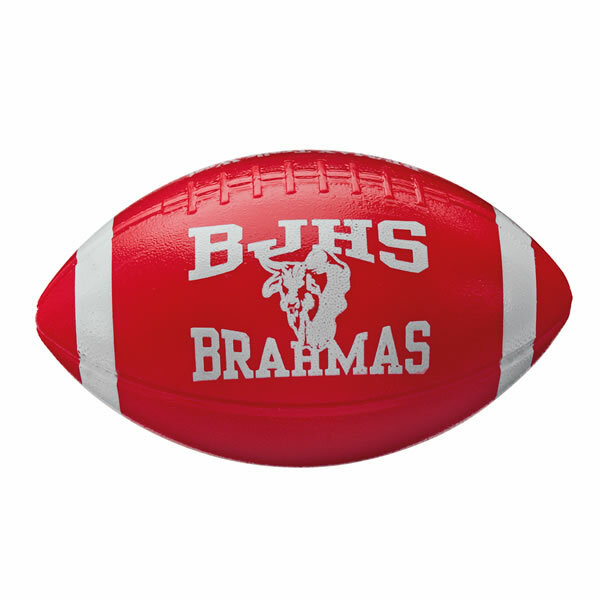 We love these 6" plastic footballs that are available in 17 colors and feature authentic detailing a durable lightweight construction. Imprint your team logo or sponsor on one or two sides. You can get your footballs with no stripe or a choice of 5 different stripe styles: standard, paw prints, stars, WIN & stars and even dollar signs. Made in the USA. Low price includes set up charge, die charge, optional stripe and 1 color imprint on 1 side. Add a 2nd color or imprint on second side for 50 cents additional charge per football. If you need art assistance, we can help set up your simple logo for a $10 art fee. These mini-footballs are great for college, high school, middle school and youth football games. Cheerleaders can throw them into the stands after touchdowns or they can be given away at homecoming. These are great keepsake items that the fans will keep - a great advertising tool for your sponsors! Quantity discounts available for this item!